salmon127 has no other items for sale. 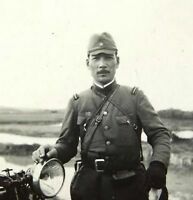 Japanese Imperial Army. Both hands grip Western saber. Free shipping From Japan. Payment by Paypal is expected within 5 calendar days. Please leave 5-star feedback for your purchase. If you don't feel comfortable leaving 5-star feedback, please email me to let me know so that I can make it right. Thank you.